(BPT) - Wherever you are in the United States, winter is coming, and for some parts of the country it’s already here. That brings festivities, good cheer, and in at least 70 percent of the country, snow and ice on the roads. While you may think those big, old plow trucks look like something vaguely Jurassic and definitely old fashioned, there is an awful lot of high tech stuff in those plows, helping to keep our roads safe and traffic moving during these winter months. Of course, all vehicles are a lot more high-tech than they were 10 years ago, but the whole winter maintenance field is undergoing a bit of a revolution with respect to technology. That new technology is beginning to have a profound and beneficial effect not only on your local streets department or highway agency, but also on the safety of the roads in winter, and the ease with which we can travel on them. Salting and plowing can reduce crashes by up to 88 percent in winter storm conditions, and that is a level of safety we can all appreciate. The value of this sort of system to road users is pretty obvious - we can see what the roads are like for ourselves along the route we are planning on taking, and thus make a well-informed decision as to whether we should allow more time for our trip, or perhaps simply stay home. The City of Chicago has a similar system that allows city residents (and anyone else who is interested) to see where the city plows are in near real time. The benefits of the system extend to commercial transportation as well. A severe winter storm that closes down roads across a whole state may cost the economy up to $700 million per day, so knowing the conditions of the roads can be very important. But there is another area in which technology is bringing huge changes in winter maintenance, and that is in the whole arena of managing resources. Increasingly, the salt spreaders on the back of those plow trucks are computer controlled, and the computers track not just how much material they are putting down on the road, but where they are placing it, so environmentally sensitive areas can be protected more effectively. These devices are also tracking the condition of the road surface itself, measuring the pavement temperature (which, much more so than the air temperature determines how effective salt will be when it is placed on the pavement, and guides how much salt should be applied) and in some cases, even measuring the grip of the pavement (how slippery it is) and using that information directly to adjust the application rate. This new technology allows agencies to provide the level of service on the roads the public wants and needs, while controlling costs and essentially eliminating any environmental concerns about salt use. Kevin Hensley, the stormwater supervisor for the City of West Des Moines, noted new technology allows their agency to manage their activities much better because they can measure what they are doing so much more effectively. “If we can measure it, then we can manage it so much better,” he says. Better management has some real bottom line benefits for taxpayers, too. “We have decreased our per-storm maintenance costs by between 30 and 50 percent while providing an improved level of service to our community,” says Bret Hodne, the director of Public Works for the City of West Des Moines. Those sorts of savings will keep you feeling warm and toasty inside, no matter how chilly the winter weather gets! (BPT) - Warming up his car for a few minutes before heading to work is a winter morning routine for Steve Bailey. “I hate getting into a cold car, so letting it warm up for five minutes is as important for me as for the vehicle,” says Bailey, who lives in Minneapolis, Minnesota. “My car is parked outside and I think it runs better after idling for a while, especially on below-zero mornings,” he says. Plenty of cold-climate folks share Bailey’s winter car-care philosophy. But advancements in engine technology is reducing the need to idle, even in colder temperatures. According to many auto industry experts, the efficiency of today’s fuel-injected engines makes winter idling nearly unnecessary for most cars. U.S. Department of Energy experts report driving a gas-powered vehicle warms it twice as fast as idling it, and most auto manufacturers recommend starting your car, then driving slowly after only about 30 seconds of idling. Excessive idling also wastes fuel and adds harmful emissions to the atmosphere. Many states and municipalities have enacted idling restrictions to curb auto emissions and minimize human exposure to carbon monoxide and other noxious exhaust gases. Consider an oil change. “Motor oil is one of the most important fluids in a car, so it’s important to go into winter knowing you’ve got clean, high-quality oil to keep the engine lubricated, even in frigid temperatures,” says Andrew Hamilton, technical services manager for Cenex brand lubricants. Check tire pressure. Properly inflated tires maximize traction on wet or icy roads and help protect against wheel damage from potholes. Test your battery. Batteries usually give little notice before dying. Since cold temperatures can reduce power by up to 50 percent, batteries that have been used for three years or more should be tested. Make sure posts and connections are free of corrosion. Remove any corrosion with a solution of baking soda and water, using a small wire brush. Top off antifreeze. Make sure your car’s radiator contains the proper amount of a 50/50 mix of coolant and water. You can check the composition of radiator fluid using an inexpensive tester, available at auto parts stores. Be sure to check the antifreeze label to see if the product you are buying is premixed. Inspect wipers and fluid level. Shorter days and precipitation ranging from snow and ice to sleet and rain pose visibility challenges in winter. Make sure wiper blades are in good condition and replace them if they’re more than a year old. Be sure the windshield washer fluid reservoir is filled with no-freeze washer fluid. For additional automotive maintenance tips and an opportunity to nominate someone for free fuel this winter, visit Cenex.com. (BPT) - It’s time again when millions faithfully pledge to better themselves by making numerous New Year’s resolutions. Some estimates report more than 40 percent of Americans make New Year’s resolutions, yet only about 8 percent achieve their goals. Happy New Year, indeed. The typical list of New Year’s resolutions include: losing weight, working out more, quitting smoking, getting a better job, spending less and saving more. Not surprisingly, missing on everyone’s top 10 checklist is an important resolution that’s incredibly easy to achieve: checking your tires monthly and maintaining them. “Even though tires are the only part of a vehicle touching the road and play a valuable role in our everyday lives, they usually go unnoticed,” says Bob Abram, product planning manager for Yokohama Tire Corporation, manufacturer of everything from ultra-high performance tires for passenger cars and SUVs to tires for buses and trucks. Checking your tire pressure at least once a month. 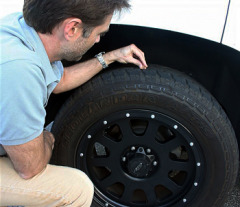 Consult the vehicle’s owner’s manual or placard on the driver’s door to determine proper tire pressure. Tire pressure should be checked when the tires are cold. Rotating your tires regularly promotes even wearing of tread. Tires should be rotated every 5,000 to 8,000 miles. Checking your alignment at least once a year or sooner, especially if the vehicle is pulling to one side. This will help avoid uneven wear on tire tread. Tire balance should also be monitored. Replacing the tire before the tread wears down below 2/32 of an inch. A quick and easy tread test involves placing a penny into the grooves of the tire. If Lincoln’s head is completely visible, the tires should be replaced. For more tire care and safety tips visit www.yokohamatire.com/tires-101 or www.rma.org. (NewsUSA) - Indications are rosy for U.S. auto sales now that the recession is in the rearview mirror. According to analysts -- who are bullish on the industry -- new vehicle sales will hit their highest level since 2006, as consumers look to replace aging cars and trucks. In fact, estimated sales are expected to land somewhere between 16 million and 16.5 million, near pre-recession levels, which would mean an increase of around 5.8 percent. Experts caution that this number is down from last year's 7.6 percent growth, and would be the industry's smallest increase since sales bottomed out at 10.4 million vehicles in 2009. The takeaway? Automakers can afford to be cautiously optimistic about sales for the remainder of the year, but also need to understand that as growth sales slow, they will have to be diligent with their marketing and incentive offerings. Rick Baranski, director of publisher relations for U.S. Suburban Press (USSPI), maintains that the most effective auto-marketing strategies use local newspaper and targeted email to increase sales. USSPI is an advertising network of community newspapers around the U.S. and is now a recognized leader of nationally aggregated email campaigns delivering targeted quantities of 50K and under through its eZIPs program. "Local newspapers are the primary information source used during the car-buying process," says Baranski. "The eZIPS email program that we offer complements the print ads by reaching individuals who are most likely to be shopping for a vehicle at the moment." Scott Slobodnik, brand manager of eZIPs, cites a case study of a dealership that sent out almost 39,000 emails at a cost of just over $3,800 using its eZIPs program. "That dealership sold 31 vehicles, for a return on investment of almost $52,000," says Slobodnik. As a matter of perspective, the National Automobile Dealers Association estimates that the national marketing cost per vehicle sold is $644, while the eZIPs program delivers on average $250, and as little as $88. "Dealers in the program are seeing outstanding results," adds Slobodnik. "In most cases, there are six to 12 cars being sold per 10,000 e-mails that are sent out." 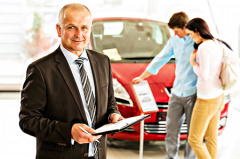 With more people working and willing to spend their money to replace aging vehicles, coupled with low interest rates, what is clear is that the short-term future for auto sales remains bright. For more information, visit www.usspi.com. (NewsUSA) - It's the season of sunshine and road trips -- and if you want to get the most out of your four-wheeled adventure, you better pack a map to go along with that electronic GPS. 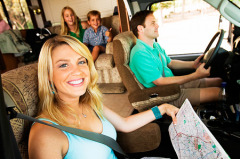 "The best reason to keep paper maps in your vehicle, especially on long road trips, is because GPS isn't always reliable," says Cynthia Ochterbeck, editorial director of Michelin Travel Partner. Confirming this trend, a 2013 Harris Interactive survey of 2,200 U.S. drivers who use GPS found that 63 percent say that the technology has led them astray at least once by pointing them in the wrong direction or creating complex, confusing and incorrect routes. So, while it may seem that paper maps have gone the way of Atari's Pong, they are still just as important as ever -- not to mention many other benefits that you don't get with some GPS devices. "One of the greatest characteristics of paper maps is that you get all of the details, [such as] points of interest," says Ochterbeck. "Plus, you don't risk getting lost when you lose the signal or the battery dies on your cell phone or GPS device." Another benefit is that, in addition to printed maps providing efficient ways of understanding road networks that surround particular areas, the information is very reliable. Plus, new specialized maps, like Michelin's Zoom Maps, are aiming to enhance the paper map experience. Most people recognize Michelin for its tires, but, unknown to many, it also has a 112-year history of creating maps and travel guides. In fact, it provided the maps that were used by the Allies for the D-Day invasion. Improving on this history, the new Zoom Maps offer seven regional maps for travel in the U.S., with the ability to zoom in on more detail in urban areas. In addition, the new maps have a "not-to-be-missed" event calendar for regions, in an easy-to-fold system so you don't have to unfold the entire map. "Technology is great, but a printed map is one of the most important tools a traveler in an unfamiliar setting can have -- the battery doesn't die, it is easy to use, and it allows you to make decisions on route changes if necessary," says Ochterbeck. "Even better, there are no roaming or data charges to worry about." For more information, visit www.michelintravel.com. (NewsUSA) - It's that time of the year again -- time for wetter roads and, unfortunately, more accidents. Russell Shepherd, a mechanical engineer for Michelin North America and self-proclaimed "tire nerd," has certainly earned his informal title as evident by his 15 years of driving in almost every type of weather condition imaginable. Most concerning for him -- wet weather. "Most people don't realize how much wet roads affect their driving," says Shepherd. "When roads become wet, it takes longer to stop and more time to react, making it more important than normal to pay attention to your car and other drivers." Check all tires regularly for tread wear and pressure. Changes in season and temperatures make it a good time to check both. Be cautious from the start. As soon as it starts raining, traction can become negatively affected. It only takes a small amount of water to mix with oil and dust to create a slick surface. Find the right tire. A tire with a grip designed to handle wet roads, such as the new Michelin Premier A/S tire, can make a big difference. This tire has a unique rubber compound engineered to maximize traction, and two sets of grooves to help channel water away from the tires to maintain that traction. The second set of grooves is hidden when the tire is new, but emerges as the tire wears. This distinctive design feature maintains the tire's ability to funnel water away, even when worn, which prolongs the life of the tire and enhances driver safety. Get in touch with your car. Take time to learn how your car responds on wet roads. Is the steering looser than normal? Are you sliding when you brake? Do you notice the ABS (Anti-lock Braking System) kicking in? If so, your tires could be losing their grip. Slow down and get your tires checked as soon as possible. 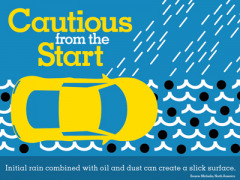 For more information about wet-weather driving and choosing the right tire for your car, visitwww.michelinman.com/. (NewsUSA) - Winter comes with a unique set of challenges, including lower air temperatures, lack of visibility, fewer daylight hours, falling snow and, of course, icy roads. These can certainly make for some hazardous driving conditions, which is why experts say you should dig out your ice scraper, gloves and snow shovels before hitting the road. "Don't set off like a tank commander with a tiny hole cleared," says Andy Smith, a patrolman in Canada. Surface Conditions. Roads and drive paths are likely to be covered with rain, sleet, snow and ice, which causes slippery driving conditions and reduces tire traction. Consider using snow tires in areas where winter weather is severe. It's also important to inspect your tires for uneven wear, cupping and proper tread depth. Also consider the last time you had the tires rotated, balanced and aligned. Emergency Situations. Winter weather increases the chance of getting into a car accident. Pack an emergency kit to leave in your vehicle at all times. Consider including safety items such as flares, medical supplies, jumper cables, a flash light, batteries, a small shovel and tire chains. Also consider comfort items like blankets, gloves and snacks. Clear Vision. Snow, ice and fog diminish your visibility, creating dangerous driving conditions. 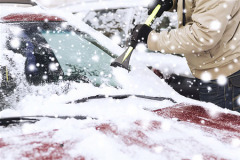 Remove all debris from your windshield, windows and outside mirrors before driving. Replace your wiper blades with extreme-weather blades for a stronger wipe to battle heavy rain, snow and ice buildup. 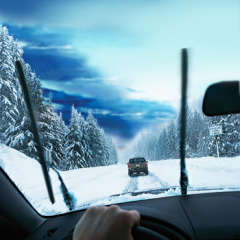 The TRICO Ice wiper blade (www.tricoproducts.com) is designed to distribute even pressure for a clearer wipe, while the contour complements new vehicle models and maximizes your line of sight. Vehicle Performance. Follow the recommended maintenance schedule in your vehicle's owner's manual to avoid hard starts, stalling and lost power during colder weather. Keep your gas tank above the halfway mark because empty tanks collect condensation, which damages the engine. Some regions experience heavy snow and dangerous ice storms, others find an increase in rainy conditions, and in some places, temperatures may just cool down a bit. Regardless of location, the winter season brings a climate change that all drivers should consider.